The Law Society have been in discussions with HMCTS regarding the issues related to the appointment process for ALRs, which has been far from smooth. In a response to the concerns raised, HMCTS has agreed to run a pilot as of 1 April 2019. As of this date, where a nominated ALR is already involved within proceedings, they can seek appointment within the proceedings and be appointed by the judge. Where an ALR seeks to be nominated within application, they will need to provide reasons for their appointment to the judge. If there is no nominated ALR within the proceedings, the judge will continue to appoint ALR’s from the ALR list. The pilot will run for a period of 3 months, where after HMCTS will take a view as to whether allowing direct nominations has been successful. The Law Society are encouraging all ALRs to put themselves forward for direct nomination during the period of the pilot, in order to demonstrate the effectiveness of the process. The current list of ALRs can always be found on the Law Society website here. The snappily named Court of Protection, Civil Proceedings and Magistrates’ Courts Fees (Amendment) Order 2018, coming into force on 25 July, will reduce the fees for applications from £400 to £385, and for appeals from £400 to £320. The reduction to these fees follows, according to Parliamentary Under Secretary of State for Justice Lucy Frazer QC MP “a thorough and detailed review undertaken by officials in the Ministry of Justice into the cost of these proceedings. Our review has identified a number of cases where the fees charged were above full cost recovery levels.” It is not clear at this stage whether those who have been charged the higher sums in the CoP will also benefit from the refund scheme that is being applied in relation to excess fees identified in other areas. We are very pleased to confirm that on 2 April 2018 HMCTS introduced the process of appointing accredited legal representatives (ALRs) of the court’s own motion, in appropriate cases. This means that the “menu” of options for representing P, as set out in COPR r1.2 is now complete. We hope that the court will take advantage of the cadre of ALRs who have gone through what appears to be the testing process of securing appointment to the Law Society’s Mental Capacity Accreditation Scheme. We’re aware that some practitioners have expressed concern that, in circumstances where P has been referred by his or her RPR to a solicitor who has secured legal aid, the court may then appoint a different solicitor as ALR. There are understandable anxieties about lack of continuity for P and duplication of work. We suggest that there is a pragmatic solution. A solicitor who has been working with P, perhaps after a referral by an RPR, and who then issues a section 21A challenge could file a statement alongside Form DLA which sets out the solicitor’s involvement with P so that the court is aware of the issue of continuity when deciding which of the rule 1.2 options to select. An accredited solicitor who wishes to be appointed as such could also file a COP9 requesting appointment. We are very interested to hear about the experience of practitioners as the new scheme gathers pace. Remember that 1 December sees the coming into force of the new look CoP Rules and accompanying Practice Directions. All of these can be found most easily on the Court of Protection Handbook website here, together with a handy destination table to show where the old Rules have gone. The changes and their background are discussed in the November 39 Essex Chambers Mental Capacity Report here. The revised second edition of the Court of Protection Handbook is now out, including an update on key developments over the past year, and a copy of the new Court of Protection Rules 2017. Those kindly people at Legal Action Group have also prepared a supplement with the update and the Rules. This will be sent out automatically (for free) to people who bought the second edition directly from LAG but can be requested (by email to lag@lag.org.uk) for free by those who bought from other outlets. It can also be found as a PDF here, and will shortly be available (again for free) as an eBook from Amazon. We’re very pleased to include this post by Simpson Millar’s Zena Soormally, which summarises the guidance from the Law Society on the role of ALRS. In other cases, a Rule 3A rep might fit the bill better. It is more likely that an ALR will be appointed if issues are relatively defined. It may be that you will be appointed as ALR at first but then need a litigation friend as case becomes more complex or contentious. It will be up to the litigation friend whether they then instruct the ALR as solicitor going forward, although I can see benefits of that. Once appointed as ALR, the usual processes follow as if you were a solicitor, as far as I can tell – e.g. see client, obtain and consider docs etc. The COP’s list of ALRs will be updated monthly. It is up to the COP how it will allocate those cases and, as far as the guidance says, there is likely to be regional differences in approach, which will no doubt cause some issues for lawyers in practice while transition takes place to the new approach. The guidance provides interesting guidance in relation to client care letters: P will be the ALR’s client but anyone acting as ALR will need to consider putting together an appropriate client care letter in line with the guidance and the SRA Code. If it is inappropriate to send a letter, ALRs will be expected to retain a copy on file with a note explaining why it wasn’t appropriate to send one. ALR’s must adhere to SRA code of conduct, as would be expected. ALR’s are not expected to send anyone else in their place to meet with P (which makes sense and must, in my view, be right, but which some senior solicitors may struggle with, if they routinely send out junior staff for client meetings, rather than attending in person). o even if you are unfamiliar with it now, that you have read the guidance re Rule 11 (7) (B) rules for MHT work, as there is overlap specifically mentioned in the guidance. As with a litigation friend, the role of ALR is to put forward a case in P’s best interests, not always just what P wants, although you must always make P’s wishes and feelings clear. Whatever happens, if you are unsure what to do, the advice appears, sensibly, to be that you should make an application to the COP (on notice or not) under Rule 148A to seek guidance. Solicitor ALR’s can conduct own advocacy in COP but you can also instruct Counsel if you wish – although, as always, they must have the right experience. The duties to your ‘client’ section of the guidance, including the sections on confidentiality, disclosure and privilege, cause me some concern, given the practice of preparing notes of visits to P, where they lack capacity to conduct proceedings, and reporting everything said to the COP by way of witness statement: I am not sure, in practice, how the balance will be struck under the ALR role, where there is no client to seek instructions from on the issue of whether something should be withheld from the statement or not. In practice, it may result in further applications to the COP for guidance, until the case law has developed to provide that guidance. Funding: this is still a pain as far as I can see but the updated information is helpful. Essentially, as I understand it, it works as if you are a litigation friend, save that you have to ask the LAA to exercise its discretion under Regulation 30 (5) to waive the need for a signature on the LAA forms. However, that doesn’t help the fact that you can only get legal aid if P is a party, wishes to be joined as a party and/or is contemplating proceedings. None of those will apply to a lot of the ALR cases, so, I imagine, that means that LAA funding will not be available unless P is, in practice, a party. That may, in effect, just mean that, until the funding issues are resolved, P will be routinely joined as a party, with an ALR. All the other usual LAA rules apply as do the usual rules with regards to private funding and/or seeking undertakings on costs from the relevant public body if legal aid isn’t available. Non LAA practitioners can become ALRs but they cannot accept cases where P is, or may be, eligible for legal aid. The borderline eligibility cases and/or those where P isn’t eligible but will be in the near future (perhaps because of built up savings) will no doubt therefore, need to go to LAA practitioners only). There will be some lag between being invited to act as ALR, and actually being able to accept, because of the work needed to establish LAA eligibility. You will not have funding to carry out that work, so we will be taking over the role, which the OS usually has to deal with, to investigate eligibility without funding being it place – that may, in some of these cases, require a number of letters and calls, which isn’t appealing, but isn’t always too onerous. The guidance specifically reminds ALRs to be mindful of advising/taking forward any linked issues with regards to judicial review and/or damages claims BUT note that as ALR you have no magic status to take such a matter forward and, as in cases now, you would no doubt need to approach someone (perhaps the OS) to act as litigation friend in those other non COP cases if you see something that needs to be progressed. I imagine, if an ALR case became a case that required linked involvement from the OS as litigation friend, the OS would also see good reason to act as litigation friend in the ALR case. 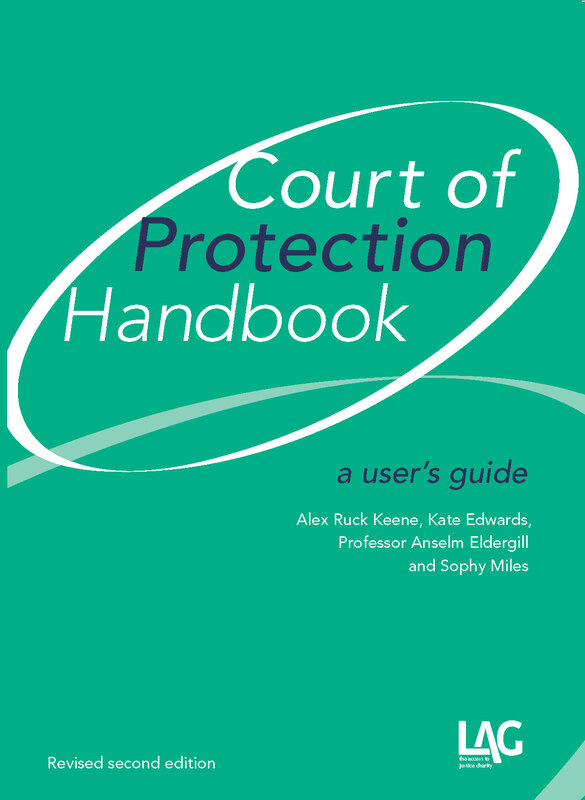 Court of Protection Handbook Create a free website or blog at WordPress.com.